I greatly appreciate your help, Michael, especially since I've been looking for a photograph of him for awhile now. Could you please look up ABEL PETTS for me. He was in the Essex Reg Pte 3601 and Pte 201190. 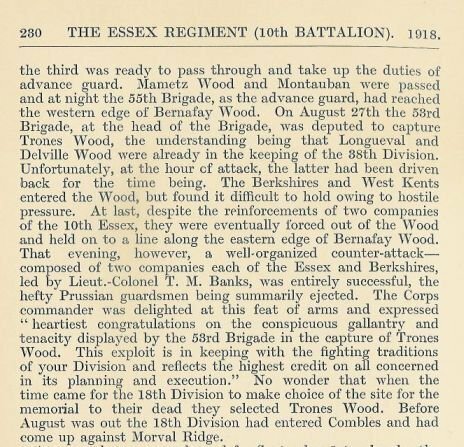 From Soldiers Died in the Great War 1914-1919, part 48 The Essex Regiment, page 40. "Petts, Abel, born Hertford, enlisted Hertford, 201190, Pte. killed in action Palestine 25/11/17, formerly 20715, Bedfordshire Regt." As is so often the case, there is no mention of Abel Petts in the book Essex Territorial Infantry Brigade by John Wm. Burrows. There is some background information concerning the day that he died, see next quote. (Pages 265 & 266). What puzzles me though, is that according to Burrows there were no men killed in action on that day. He used the War Diary of the 4th Bn., amongst others, as source material and usually these diaries mentioned casualties. "The 1/4th relieved the New Zealand Mounted Rifles on November 24th in a position to the south of Nahr el'Auja, and moved two companies – "B" Company (Captain Carhart) and "C" Company (Captain Fanshawe) – across the river to support the Rifles in the capture of a position on the north side of the river, which they commenced consolidating. The two companies were transferred to Khirbet Hadra at10.30 p.m. in support of the advanced posts of the New Zealanders. Battalion headquarters and the two other companies remained on the south side of the river. Early in the morning strong enemy attacks drove in the advanced posts and with heavy shelling forced the two companies across the river, where they withdrew to their original position south of the 'Auja. During the fight Captain Fanshawe was hit and Captain Carhart assumed control. He was also shot twice through the shoulder and gallantly tried to carry on, but was persuaded to hand over to Captain P.W. Scott and report to headquarters. Plucky rescue work was done by C.S.M. Fish ("C" Company),who brought a number of wounded across the river by way of Jerishe Mill. A mortally wounded officer was ferried over on a stretcher supported by logs of timber from the ruins of the millhouse under heavy machine gun fire. The 1/4th were relieved by the 1/5th Essex and moved into bivouac at Sarona. Five officers and 97 other ranks were wounded in this operation and 2nd Lieut. E.M. Saunders died of his wounds in the C.C.S. on December 4th following. Forty-five of the men cut off at Kh. Hadra were taken prisoner." Thank you so much, that is interesting. I will have to print it off to show my dad. Thank you, I never knew that. Do you know where I could order a copy of the article? Which library in Essex to contact? I would love to see it and also copy it for my dad. Just had a thought Owen, do you know if there is a photo of Abel in the Essex Chronicle? May I trouble you for a look up of what the 10th Bn Essex Regiment were doing on 27th August 1918, please? My interest is in a Cpl Nicholas Gould who died that day and (at some stage during his service) had been awarded the Croix de Guerre. Just before Michael pops along with all the info. Its one of the diaries I don't have yet, unfortunately. Bit busy the last couple of days Chris, but I'll get back to you with some general background information from Burrows tomorrow or the day after. Many thanks for that pointer - very useful. As so often, there is not all that much specific information about that day. Grin. Note that the C.O. of the two Essex Companies is one and the same as one of the authors of this graphic description. See attachment for what Burrows has to say in Essex Units in the War 1914-1919, Service Battalions The Essex Regiment, Vol. 6, 1935. Many thanks, Michael, that's a very good piece for setting time and place. i have just returned from a wonderful trip to Gallipoli and whilst there visited the grave of a friends Great Grandfather at Lala Baba Cemetery. the guides that took me were fantastic and really came up trumps with some info from Westlakes book that indicate the soldier was one of eight men killed and approx 35 wounded by a shell on the 30th August 1915. Six men from the regiment lay in adjacent graves with the same date of death. The soldier in question is Private Edward MACKLIN 1264 of the 1st/7th Battalion Essex Regiment. Would you by any chance have any more info on this incident or movements before that date please? The date you mention sounded very familiar and after some searching I found I had posted some information here. “Two days later it was transferred to the beach below Lala Bala. This hill had fairly steep sides on the seaward slope and the beach thereunder was narrow, so that the 7th felt fairly safe, even though the Turks were fond of shelling a battery nearby. It was, however, a “poisonous spot, which received ‘overs’ aimed at the shore batteries and ‘shorts’ intended for the naval vessels.” When the rations came along next morning there was an issue of bread, to the great delight of the troops. Unluckily, just as the food was being distributed, a shell came over and burst right in a group of men, causing some 43 casualties, of whom eight were killed. It was the most severe day’s loss so far of the campaign and cast a gloom over everyone". One of the many ironies of war. yes, a great trip and visiting Edward's grave was a memorable moment indeed for me, although not related to him i felt that i was on a pilgrimage on behalf of his family who have never visited. I left a cross on his grave from his Grandson with a personal inscription on it. Very mixed emotions reading your reply, great to have found out more about what happened but what tragic circumstances and such heavy casualties from a single shell. I am very grateful for your reply and i will pass this on to my friend, thank you very much. I've just joined the forum and am still getting used to the controls. Would you please be able to look up in Volume 6 any reference to my grandad Harold (Harry) Melville Barlow, 205558, he won the M.M. which I am trying to track down. I'm afraid I'll have to disappoint you. There is no mention of your granddad in Burrows. I had a look in the database of the London Gazette and there are 740 hits for the name Barlow, so you’d have to have systematically plough through these to find the mention of him. It will most likely be exactly that. The occasion for winning the M.M. wasn’t published as far as I know. The site is very slow to access. You could try to contact our fellow member Owen4256. He has an extensive database of soldiers of the Essex Regiment. Do you have more particulars like which battalion, approximately when the medal was won, etc.? Do you have his Medal Index Card? Thanks for taking the time to have a look. We already have grandads medal index card and a copy of his entry in the London Gazette. We believe he was in the Maricourt area of France when he won his medal and like many others my dad would just love to know what his father did during the war. I'll contact Owen4256 and see if he can help. The Gazette date was the 24 Jan 1919 and he was in the 10th Battalion, Essex Regiment - there is also a (TF)? after the Rgt on his card. The MM award card also has a Registered Paper - 68/121/727 and a Schedule Number 197734 if that helps. Looking at some of the other 10th Battalion recipients in the same LG edition: one was killed on 8th August 1918; some of the others were wounded in August/September 1918 including two who were reported wounded in the War Office List of 23rd September 1918. I believe this list relates to the assault on the Tara/Usna line of 23/24 August 1918. On balance I would say the MM was awarded for the period mid August/ late September 1918. The most significant 10th Battalion action in that period was the action of 23/24th August. Looking at other transfers in with similar service numbers, I think it likely that Barlow was part of the re-inforcements that joined the 10th Battalion after it was decimated on the opening day of the Battle of Amiens on 8th August 1918. Thankyou very much. Just to clarify, are you saying his MM was sold by medalauctions.com in January 2006?, if so I don't suppose you know who bought it or how I could find out? His full medal group was offered for sale in their December 2005/January 2006 list. I suggest you email Andy at info@medalauctions.com and ask if they are prepared to pass on your details to the buyer. ( I assume you would like to make an offer!) Most dealers will be happy to do this. If they no longer have the record of the buyer they can probably put a wanted add in their next list/web update. I still have a hard copy of this list somewhere if you should need the lot number. It would be a great story if you could track them down so please let us know how you get on. I think I've found them!! Andy has passed on some info to me and I have a dealers website showing them for sale, I just hope the site is upto date.